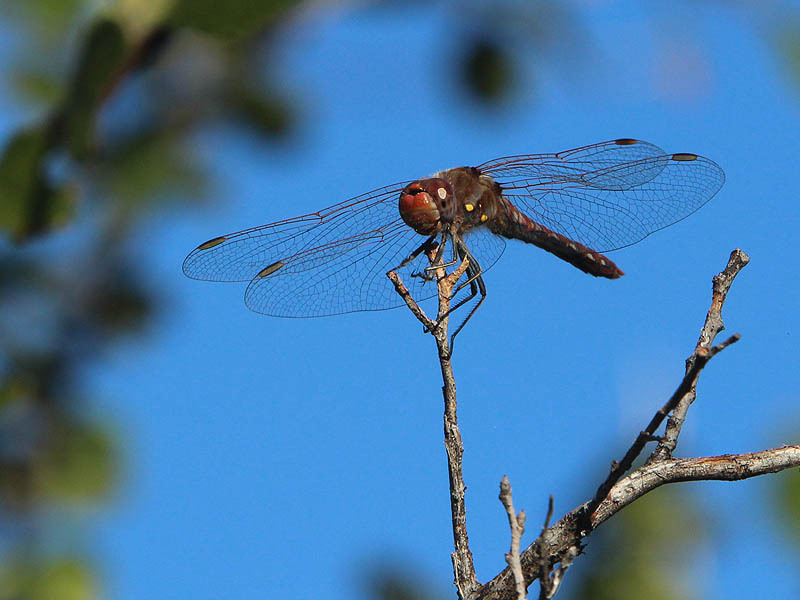 If you are hoping to see wildlife it often pays to get an early start. A good plan is to arrive on site before dawn and wait until there is just enough light to see before you begin. Another tip—head west and keep the sun at your back. 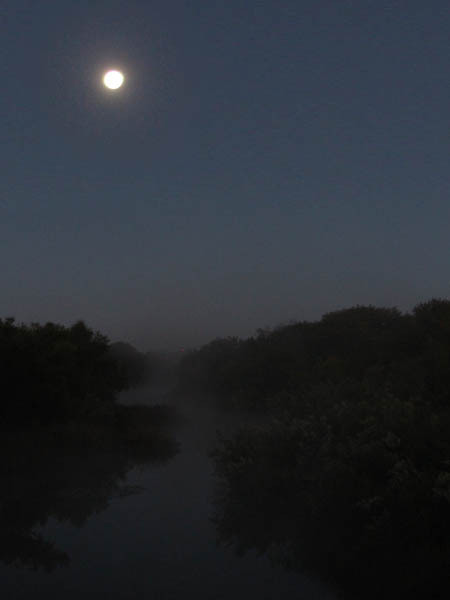 The moon over McWhorter Creek. This simple scenario accomplishes a couple of important things for you. 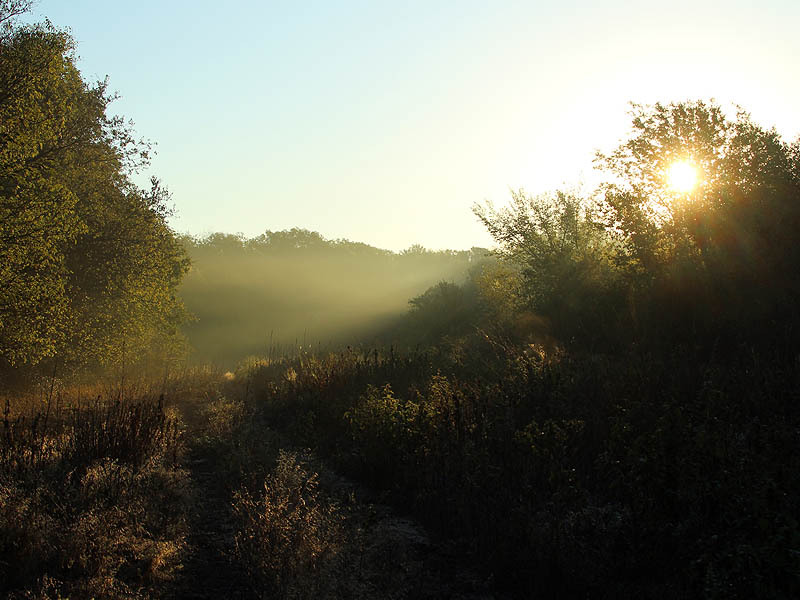 Getting started at the crack of dawn means that you will be in the field at a time when wildlife will be most active. Many animals feel more comfortable during the transitional time between night and day (and day and night, but that is another story). This is especially true during our hot summer months when morning is the time when temperatures will be the most moderate. 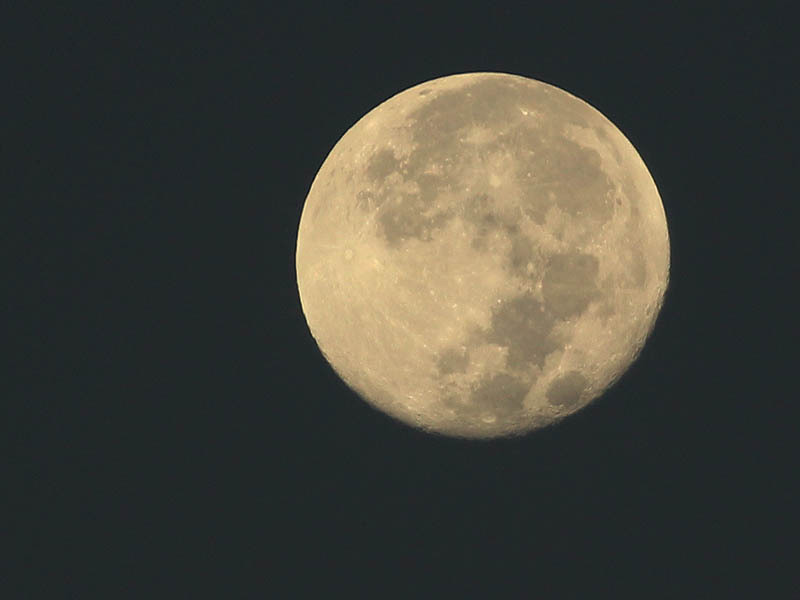 When the sky begins to lighten with coming of dawn the details on the lunar surface become more pronounced. Wild animals also appreciate the low light of dawn for its concealment value. The camouflage characteristics of the brown, gray, and tan fur that many wild animal sport are actually most effective under these kinds of lighting conditions. You can take advantage of some of the benefits of break-of-dawn lighting yourself by keeping the sun at your back. When the sun is low in the sky, its blinding glare and the uniform silhouette of the landscape behind you can combine to make you virtually invisible. Another big plus of this technique is that your subjects will almost certainly be lit with the gentle light of dawn. This creates some of the best possible picture taking conditions. On the morning of this hike, I used that exact scenario to my advantage on several occasions. 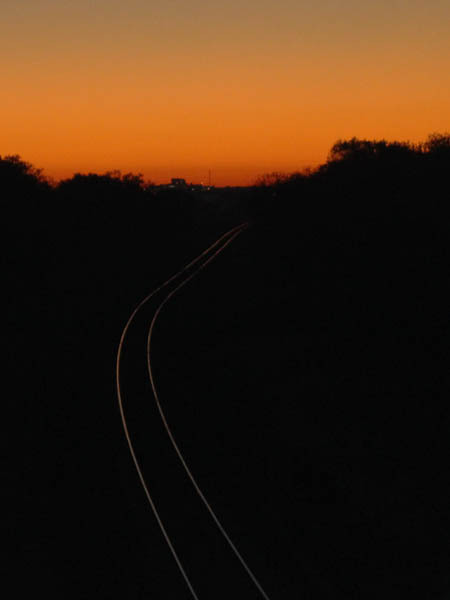 Railroad tracks at predawn near Lewisville Lake. My first wildlife encounter of the morning was a pair of Raccoons. These two masked bandits were working their way down the trail and coming straight toward me, pausing only periodically to nab grasshoppers off of the weeds growing on either side of the trail. 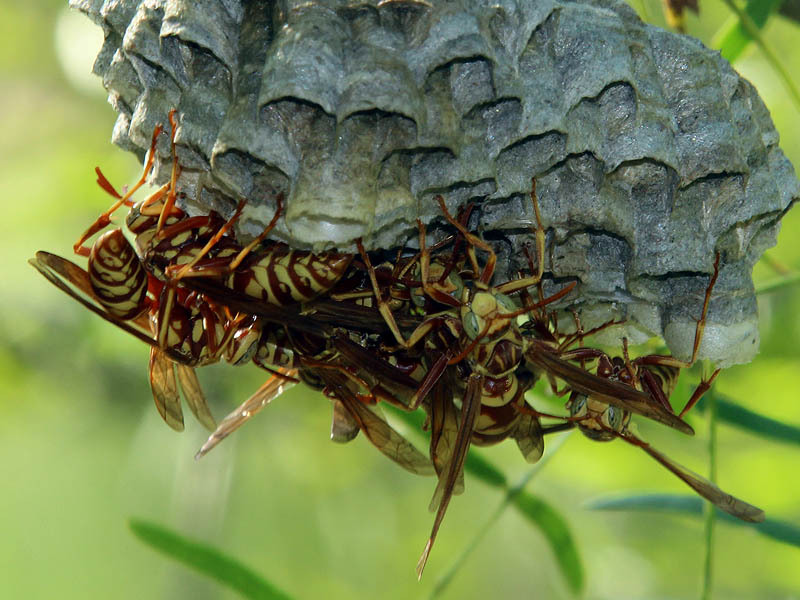 The cool morning temperatures made the grasshoppers sluggish and easy picking for the two resourceful Raccoons. It was a situation similar to the one described in this post: Raccoon – A Cold Day in August. I was well hidden in the shadows of the trees behind me The Raccoons were steadily heading my way, so I decided to simply wait for them to come to me. I knelt down one on knee and moved my camera into position. Just a little closer and the Raccoons would be in the perfect spot for pictures. But my plan went awry. Something startled the Raccoons and they ditched into the tall grass of the adjacent field. I could see the weeds part and sway as the two Raccoons plowed headlong in their flight across the grassland. I was disappointed. I must have done something to alert the Raccoons, although I was not sure what it was that gave me away. Somehow I had alerted the Raccoons to my presence. When I turned my gaze back to the trail I was startled to find myself face-to-face with the real culprit—a handsome young whitetail buck! The deer stood rigid. He seemed to sense that something was not quite right, but because of the harsh backlighting he could not see me. But not for lack of trying. Minutes passed as he stared right at me. He sniffed and snorted. 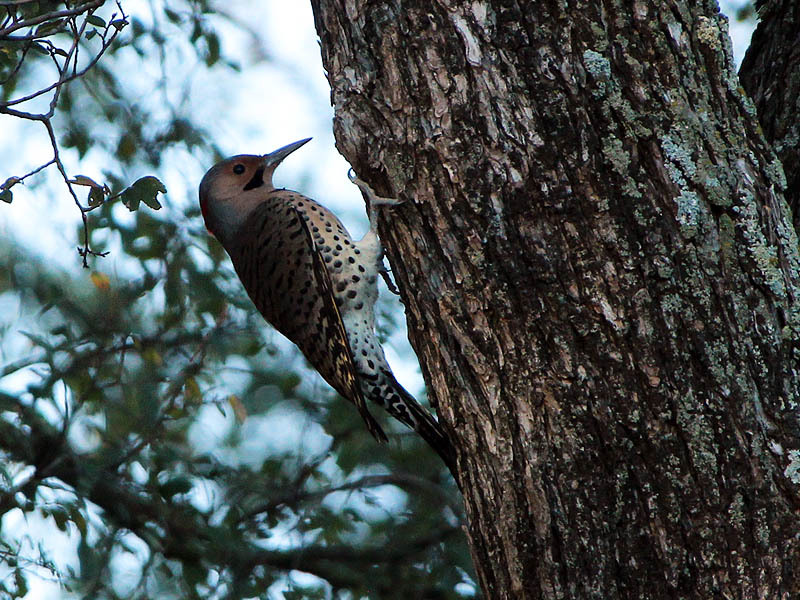 I’m sure he could hear the clicks and beeps of my camera—but no matter how hard he tried, he simply could not see me. We stayed that way for several minutes before my rickety knees began to ache too much to continue kneeling. When I stood, I gave myself away. The motion was just enough to trigger the deer’s flight response and he bounded for the woods. 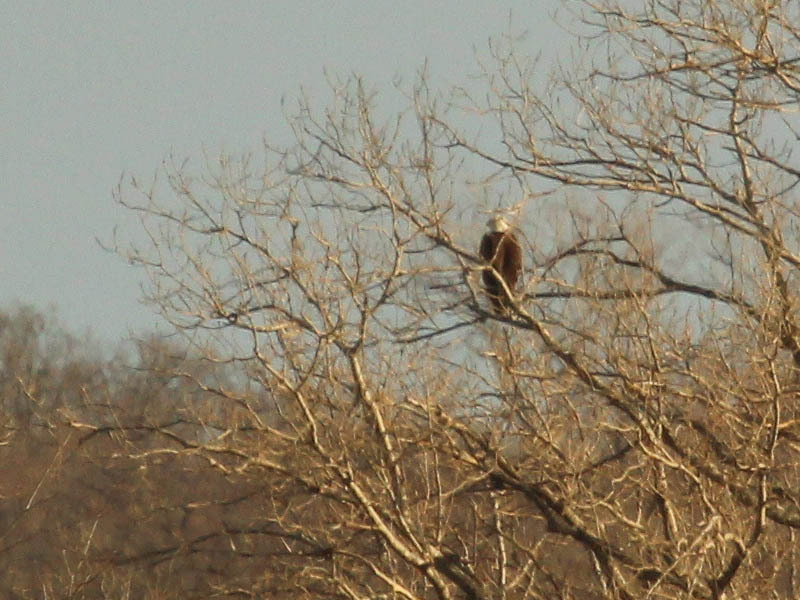 Fortunately, this was only the first of many great wildlife encounters I was to have on this day. The morning was shaping up to be the start of a beautiful North Texas autumn day. We are only blessed with only a handful near-perfect days like this each year, where the skies are blue and the temperature is just right. You have to take advantage of them whenever they come around. I stayed in the field until well after noon and made many more interesting observations even long after the sun risen too high in the sky to be much help concealment-wise. A sampling of photographs follows. 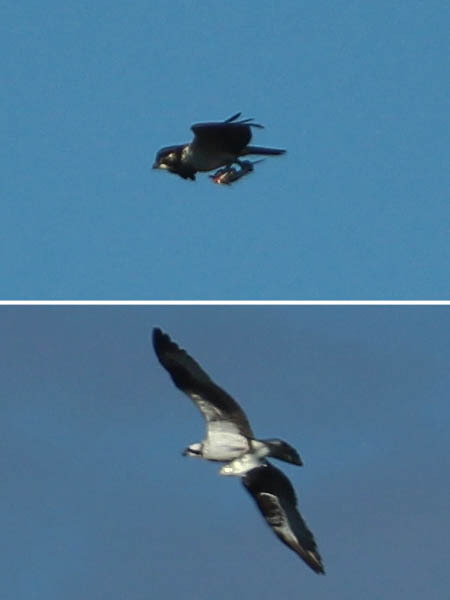 Two different Osprey photographed near the Trinity River. Each is carrying a captured fish. Despite their formidable defense Striped Skunks are preyed on by many of our resident predators. 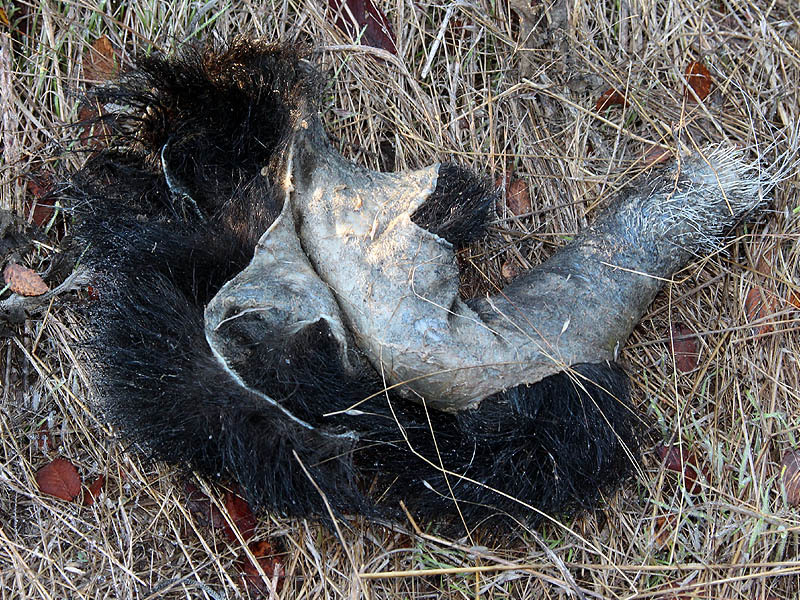 This skin is all that remains of a recently killed skunk. 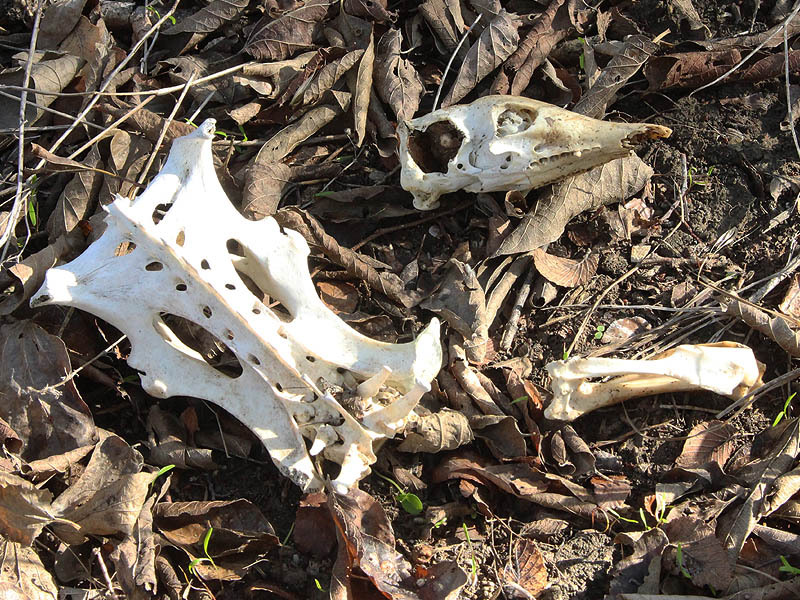 An Armadillo skeleton—skull, pelvis, and leg bone. 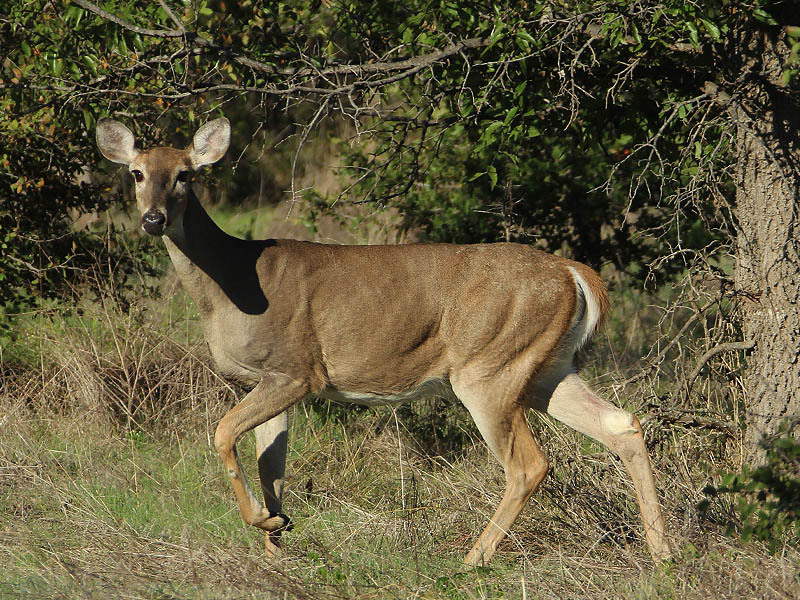 The day ended as it began–with a nice White-tailed Deer sighting. 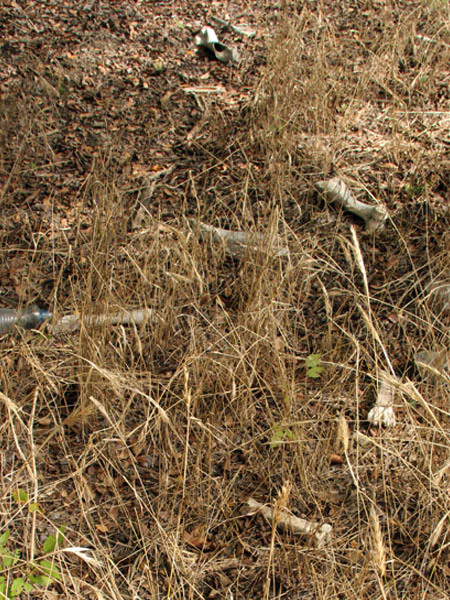 I had moved down close to the railroad tracks in order to investigate a set of skeletal remains that had caught my eye. From the looks of things, some large mammal (a cow, horse, or the like) had come out on the losing end of an encounter with a locomotive. 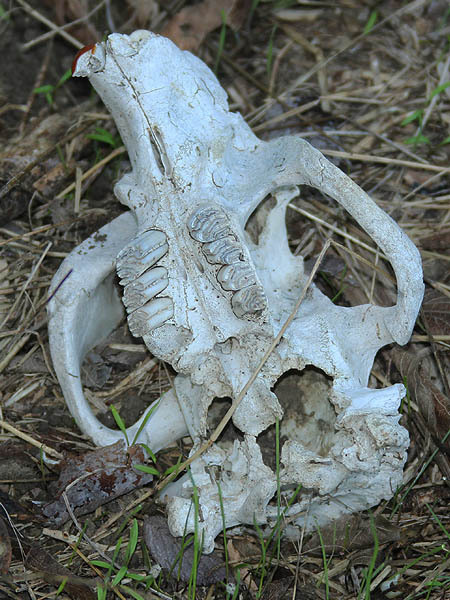 The skeletal remains of a large mammal. The skeleton was scattered and did not seem to be complete. I looked high and low for a skull without luck.—a skull bone would have certainly helped me identify the remains in the field. While I was searching for the skull, I noticed a small herd of deer crossing the tracks just short distance from where I stood. They had not spotted me yet, so I slowly and stealthily moved to a better spot for taking their picture. As I lifted my camera into position a loud hiss followed by the rustling of grass caused me to freeze in my tracks. The sounds were unmistakable. Sure enough, as I turned my head to the side and looked down, I could see that I was standing right next to an angry Cottonmouth! Now I was really in a quandary. If I moved away from the snake I might miss out on the pictures of the deer. If I stayed put then I ran the even more serious risk of being bitten. I did the only thing I could do—I took pictures of the deer while cautiously exiting stage left! 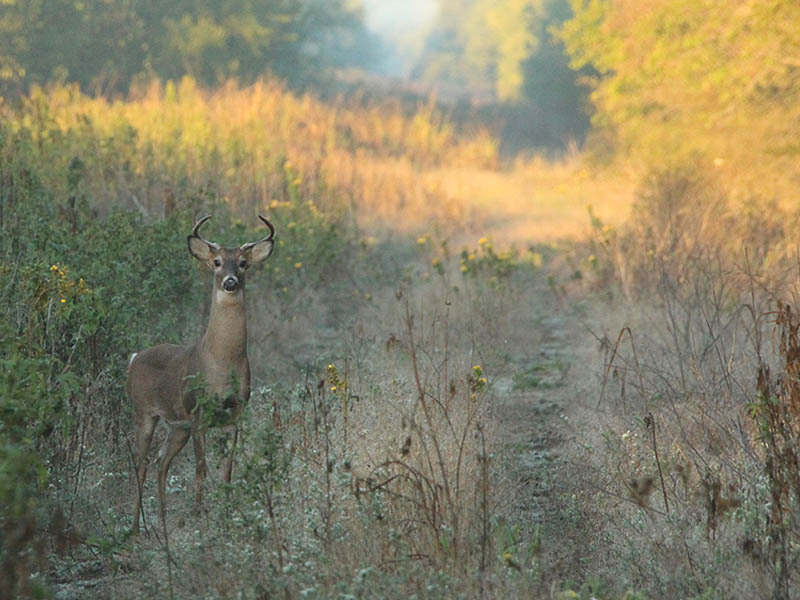 With a little more room between me and the ornery snake, I was able to give the deer my full attention. 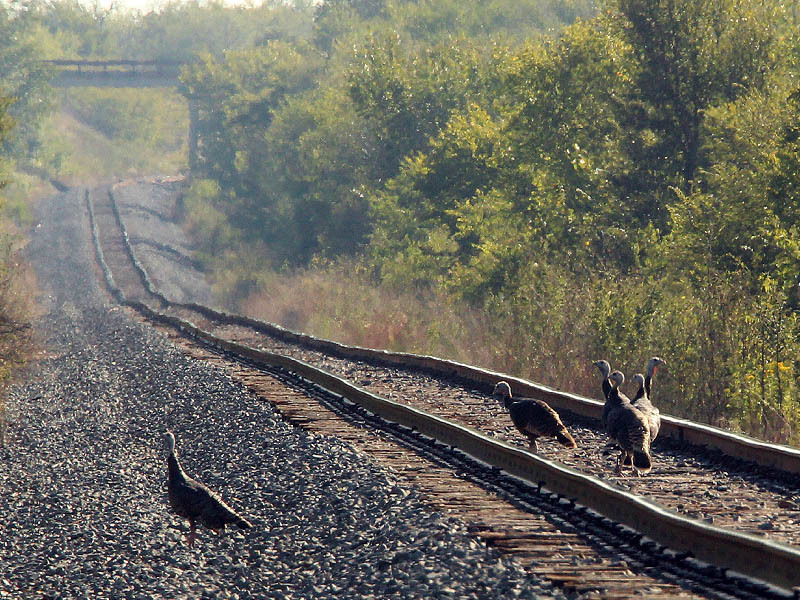 Somehow they did not notice me as I tiptoed away from the Water Moccasin, and the deer continued on across the tracks uneventfully. There were four does in all, and I managed a couple of nice pictures. 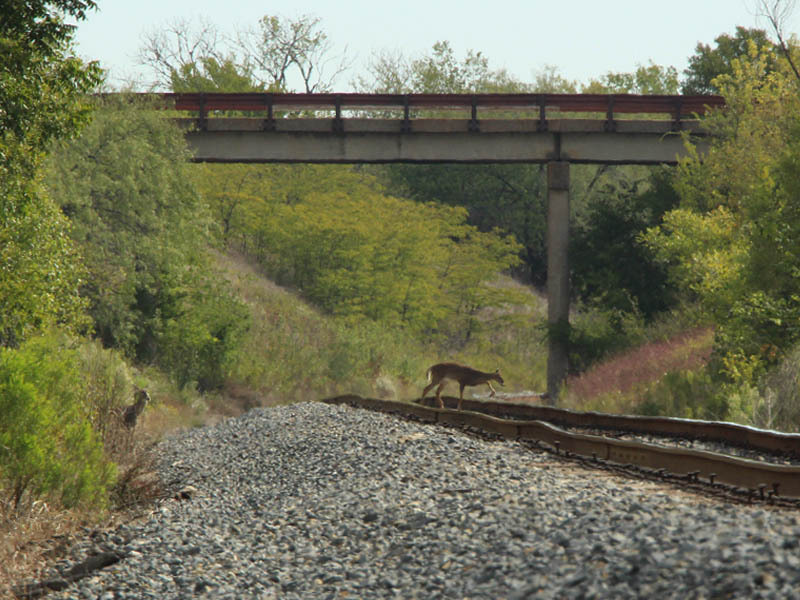 A small herd of deer crossing the railroad tracks. Once the deer were gone, I turned my attention back to the antisocial Cottonmouth. The snake had been grumpy for a reason. He was preparing to shed his skin and therefore was in a vulnerable state. His eyes were clouded over and the snake could not see well. As I photographed him it quickly became apparent that while the snake could detect motion, he could not effectively track my location as I moved around him at a safe distance! 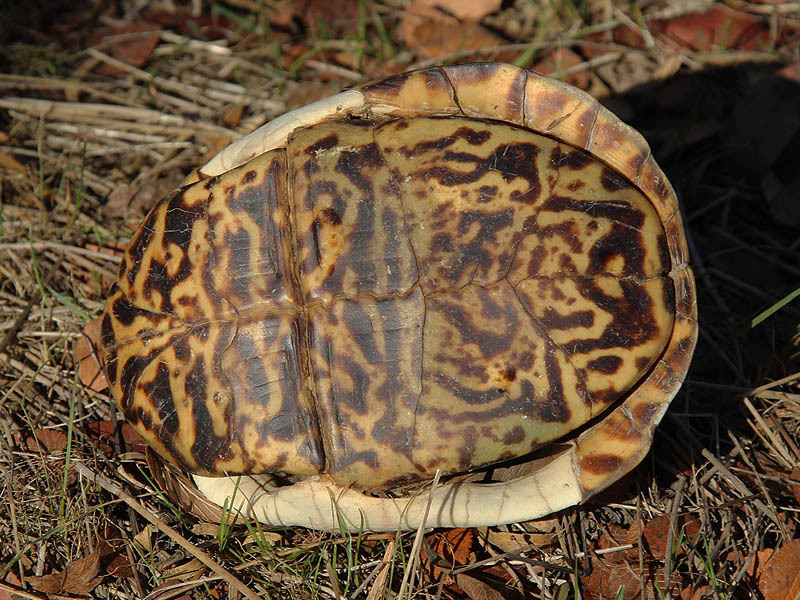 Ornate Box Turtle – Extinct? What an amazing day of wildlife observations you had. I could do without the cottonmouth encounter myself, but glad you made the most of it. The skeletons and skulls are impressive. Yep, it was a big day! More pictures from that hike will post over the next several days. 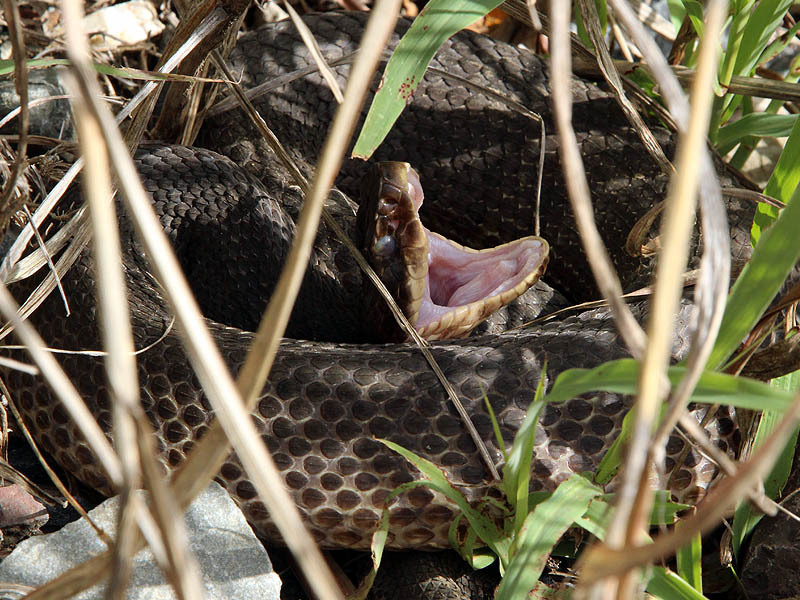 the Cottonmouth encounter was certainly unnerving! They always are, and this one particularly so, because I wouldn’t have expected to find a Cottonmouth where i found this one. Still, I am always glad for every wildlife encounter I have! Even Cottonmouths!